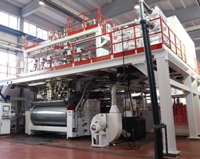 A particular feature of the line, water-cooled drives for the extruders, attracted EB Packaging to the line. 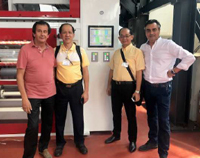 Meanwhile, EB Packaging CEO, Siow Chew Kiong, was impressed with the speeds the 2,000 mm-width seven-layer line had to offer, especially the maximum speed of 900 m/minute in winding and a maximum line output of 1,700 kg/hour. Set up in 1995, EB Packaging is involved in the manufacturing and trading of packaging, such as stretch film, plastic bags, PE foam, air bubble films and all kinds of adhesive tapes.